The new Vanity Fair is all about her Serene Highness (I used to wonder as a child - did this mean she wasn't allowed to be mad? 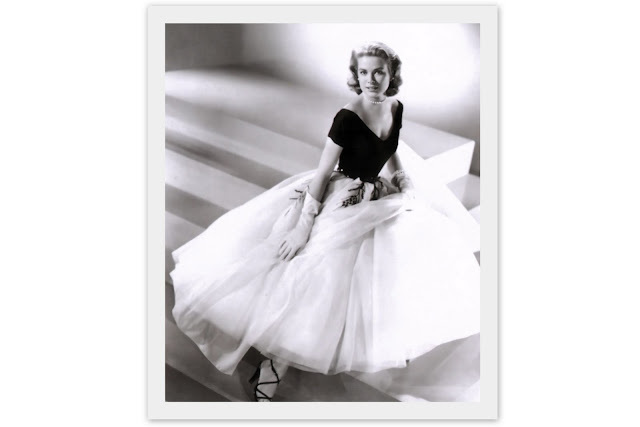 ), Princess Grace. I'd just finished reading a bio of her over my vacation, one short on text and heavy on pictures - as any book about her should be. That was the same week I visited the Princess Diana Exhibit, so it was a few days of heavy princess-ing. The contrast between Grace's bio and Diana's exhibit was that, despite the pressures and restrictions of royal life, Grace's movie-star background stood her in good stead. She was always a hard worker and a quick study, and that famous self-discipline made her much stronger than the younger and inexperienced Diana in the harsh glare of public scrutiny. 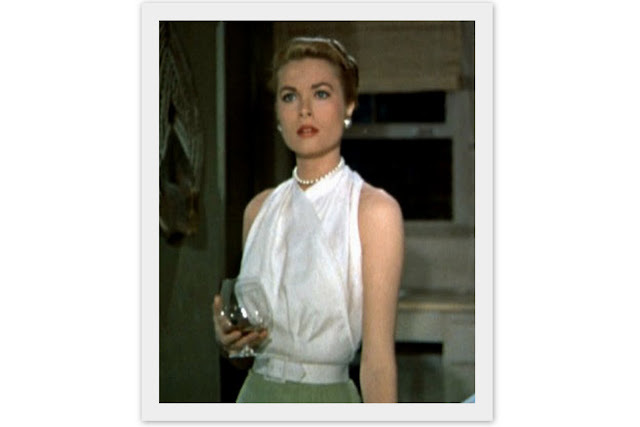 Below, one of the best of Grace Kelley's fashionable moments: the movie Rear Window. The movie is memorable for a number of reasons. 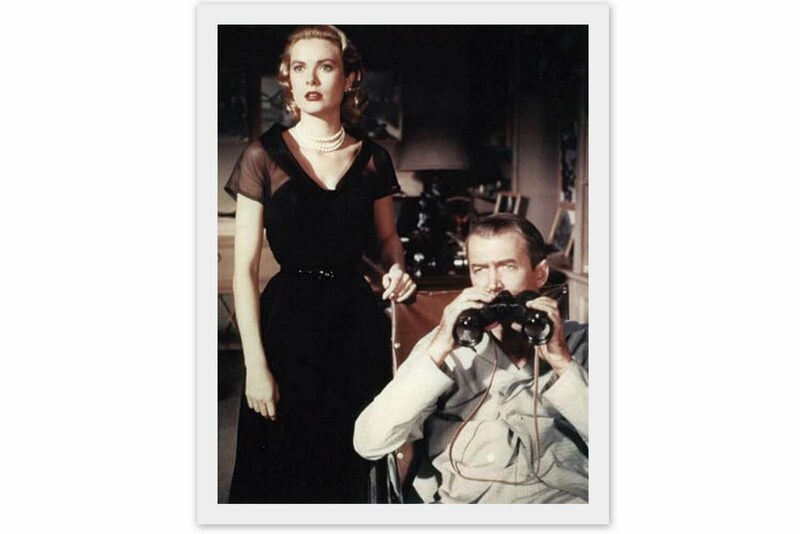 It was a wonderful confluence of talent (Hitchcock, Jimmy Stewart, Thelma Ridder, Raymond Burr) filmed almost entirely in a single setting, Stewart's tiny apartment, with its window-with-a-view. But the costumes are the most memorable of all. 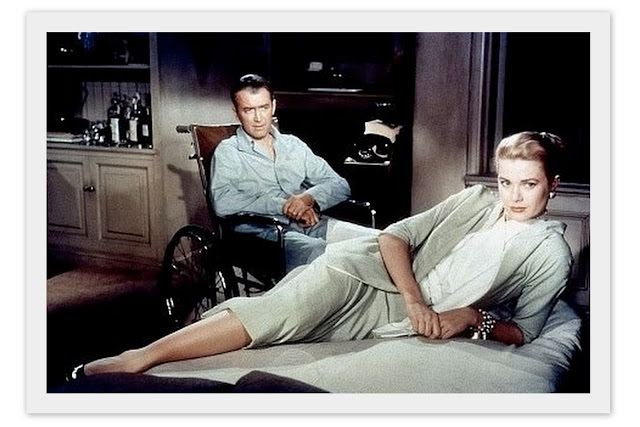 Designed by the notoriously gifted Edith Head, each one is so breathlessly arresting, they practically steal the scene. A stunning green three piece suit - note the wrap blouse finally revealed beneath. 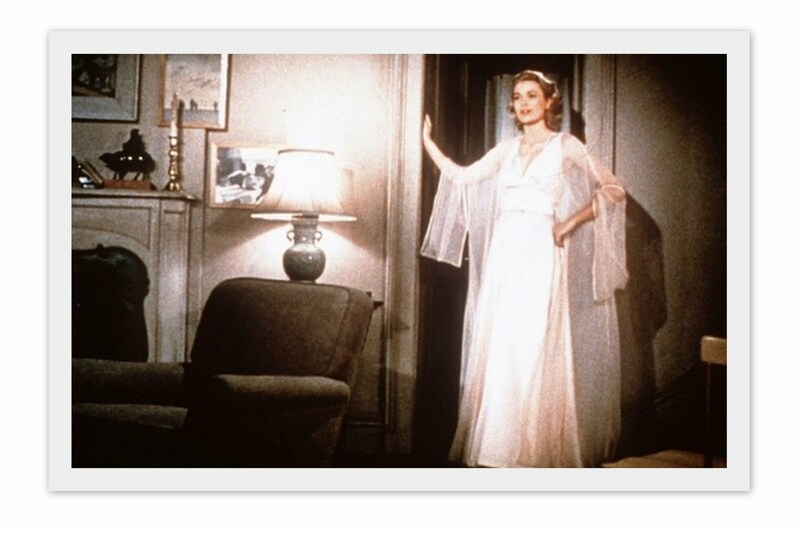 Here's the stunning nightgown scene, which drives poor Jimmy into a fluster. 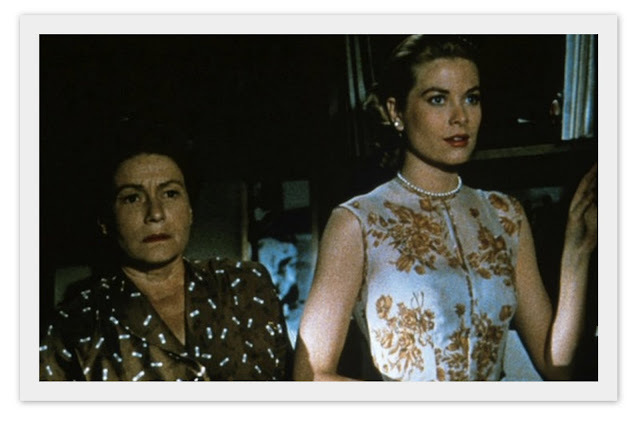 A perfectly proper Grace in florals, watching anxiously with Thelma Ridder. A very chic black evening gown. Wouldn't it also look lovely without the sheer sleeves? cap sleeves, and a gorgeous pouf of a skirt ringed with feathers. Jimmy appears to be suffering terribly. Images, the IMBD database. Vanity Fair Cover, vanityfair.com. An elegant person with timeless style. I love these styles. My favorite fashion time period. :) Thank you Jenna - so good to hear from you! 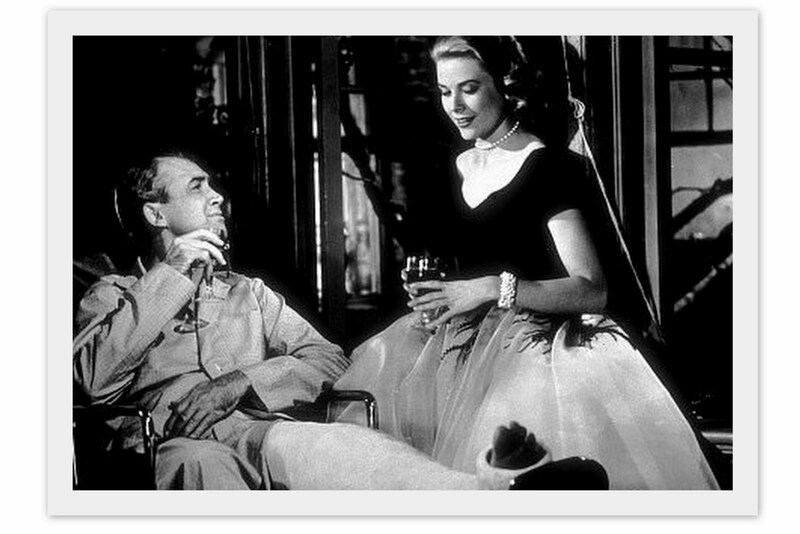 Always inspired by Grace, can't wait to go through the new Vanity Fair! Love Grace Kelly, especially in Rear Window. She's the epitome of elegance and (befittingly) grace. Grace was so beautiful. The epitome of cool elegance. I just found you via 'Annechovie' and loved the name of your blog so I had to check it out...lo and behold, I have the Dorothy Rodgers book - found in an antique store where I live AND another book of hers: "My Favorite Things" - both great tomes. Your post about Grace Kelly - I just loved her as a child and learned everything I could about her. An exhibit of her clothing is debuting in London I think this month...wishing I could go. 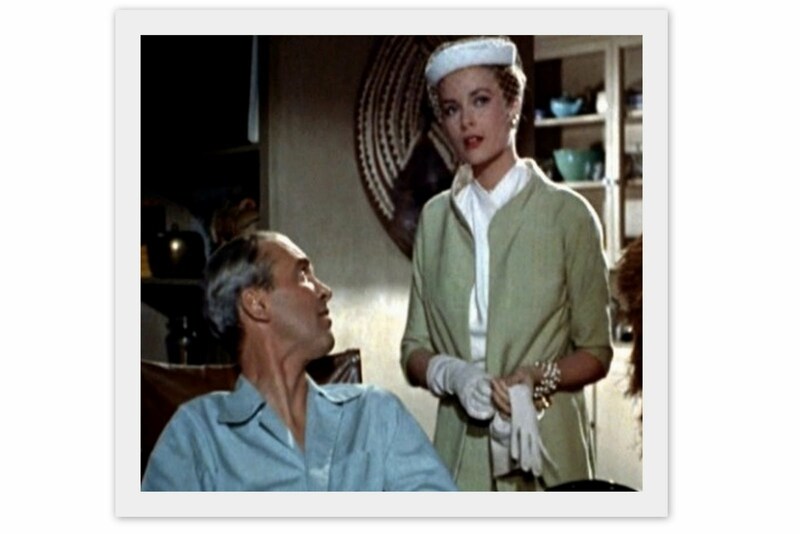 I just love her clothes in 'Rear Window' -and her handbag and the little overnight bag she brings to Jimmy's apartment. I'm a fan! thanks! I can't tell you how much I have been dying to get to my desktop all day today to see these pics! Saw this post in my reader on my iPhone between appointments today and couldn't wait to get her to see them bigger and re-read your take on this icon's style. You chose perfect images! 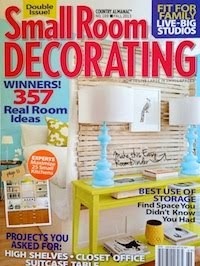 Haven't read my Vanity Fair yet but that is next on my list tonight! Have a great weekend! She was definitely one of the most beautiful women in the world.. STUNNING!! !